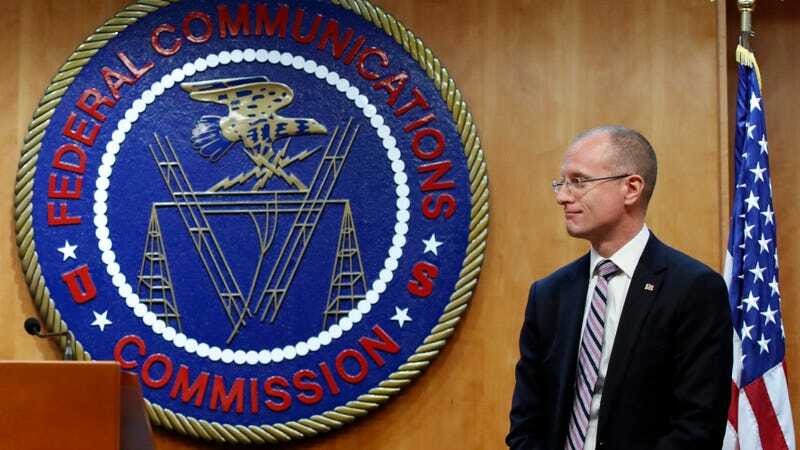 Federal Communications Commission (FCC) Commissioner Brendan Carr answers a question from the media after an FCC meeting to vote on net neutrality, Thursday, Dec. 14, 2017, in Washington. Two weeks before voting to rollback the net neutrality rules, FCC Commissioner Brendan Carr wrote an op-ed for the Washington Post in which he laid out his case for killing off the policy that ensured a free and open internet. In it, he offered up one widely-disputed argument for doing so: that blocking, throttling, and the use of so-called “fast lanes” by internet service providers would violate antitrust laws. The Federal Trade Commission (FTC), Carr wrote, would handle it. This week, the Chairman of the FTC said that’s not necessarily true. Three days ago, however, FTC Chairman Joseph Simons—a Republican, like Carr, appointed by President Trump—publicly debunked Carr’s claim. “Blocking, throttling, or paid prioritization would not be per se antitrust violations,” he said, in a speech at the National Press Club. Paid prioritization is a type of price discrimination, which is ubiquitous in the economy. For example, think about when you walk into grocery store. Some customers get lower prices because they cut out coupons. Others might get a seniors discount. Others might get 2% off with their credit card. Yet others get discounts because they have a loyalty card with that supermarket. Those of us who go to the afternoon movie matinees will generally pay less, and those of us willing to show up at a restaurant before 6 pm might get the benefit of a lower priced menu. And of course, let’s not forget Happy Hour discounts. Simons’ argument that the FTC can’t (or won’t) penalize ISPs for such schemes isn’t news. Carr’s claim that the FTC would step in and shield consumers from ISPs attempting to manipulate internet speeds for profit—a talking point parroted by the industry itself—was widely refuted by legal experts prior to the vote. With a member of his own party now debunking his argument for repealing net neutrality—a key agency official, no less, whom Carr assured us would safeguard internet users in his place—Carr’s op-ed for the Post can finally be seen by everyone for what it always was: propaganda aimed at helping ISPs engage in discriminatory practices absent the fear of regulatory reprisal.